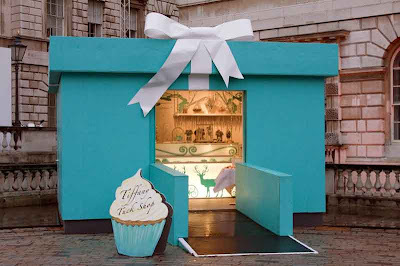 Our daughters would be happiest with cupcakes; my wife would be happier with a Tiffanys diamond! Sounds like my kind of shop! Wow! That's just beautiful! What a cute little store... and what a fantastic picture of it! Who wouldn't want to walk right inside that box? So sweet. What a cut little shop. I would venture in to see what they had and most likely I'd leave with a cupcake. How utterly horrible. Even your camera skills haven't transformed it into anything other than . . . oh, golly, it's awful. Somerset House did you say? How can they allow it? Eye catching anyway! Aaaaaaaaaaagh! I'm going away with nightmares. P.S. Sorry to disagree with your other commenters but how can they . . . oh! Cupcakes and diamonds? Only in London! Love this. What a great city London is. I thought I had misread the word diamonds, but it really is there! I just don't want to know how expensive a visit to that little shop will cost. Oh how cute. And I can't believe how trendy little iced cakes are these days! Oh that is too lovely, it tempts me into going in and getting cupcakes. Very cute but in completely the wrong location. I guess it's only temporary while the ice-skating continues. What a cute little shop, very clever idea to bring people in. Lovely photo. Oh that is so cool!I miss London!